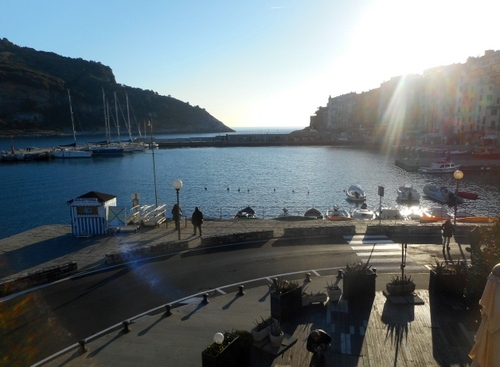 La Spezia, the starting-off point for a visit to that stunning stretch of Italian coastline known as the Cinque terre and to Porto Venere, is an interesting city in its own right. From a small fishing village La Spezia developed into one of Italy’s major naval dockyards, which I was able to visit on a special open day in 2014. (See my post at https://longoio.wordpress.com/2014/03/23/a-top-secret-establishment/ ). Cristo Re dei Secoli (“Christ the King of Centuries”, cathedral), consecrated in 1975. The project was by Adalberto Libera. Unless you’re into seventies architecture give it a miss. I found it rather hideous and akin to a second-rate airport terminal although the view from it is rather fine. Abbey church of Santa Maria Assunta (“Our Lady of the Assumption”, thirteenth century). It houses a considerable series of artworks, some of them coming from other suppressed religious institutes. They include an Incoronation of the Virgin by Andrea della Robbia, the Multiplication of Bread by Giovanni Battista Casoni and St. Bartholomew’s Martyrdom by Luca Cambiaso. Definitely worth a visit. Santi Giovanni e Agostino (“Saints John and Augustine”, sixteenth century). 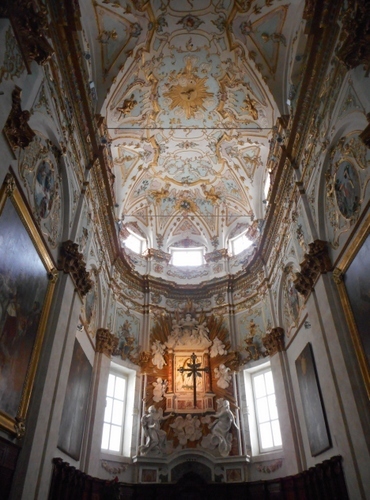 It has a single nave with eighteenth and nineteenth century decorations. 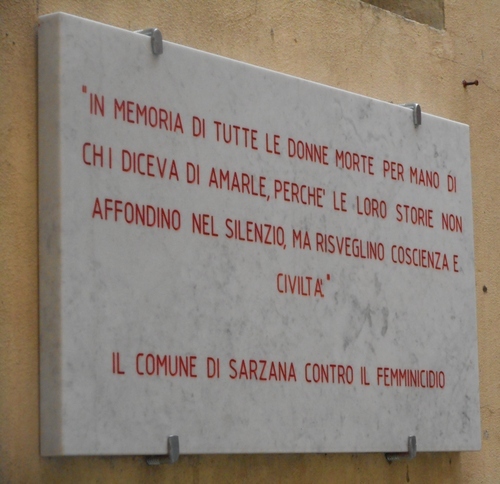 Nostra Signora Della Scorza. Built in 1900 in the heart of the working-class neighbourhood Quartiere Umberto (Piazza Brin). Amedeo Lia Museum. Super collection of paintings from all ages put together by a private connoisseur. Palazzina delle Arti and Museum of Seals (not the sea mammals but the ones you use sealing wax for). Interesting if you like this sort of thing. Museum of Modern and Contemporary Art (CAMeC). Not seen yet. Changing exhibitions. Diocesan Museum. Fine religious art. Ethnographic Civic Museum. Fascinating insight into disappeared local crafts. Technical Naval Museum. Great viewing for anyone who loves messing about in boats and naval history. If you enjoyed London’s Greenwich Maritime museum the collection is a must and is located in a building within the military arsenal. National Transportation Museum. This I haven’t seen yet. It’s evidently filled with old steam locomotives and other modes of transport like trams. 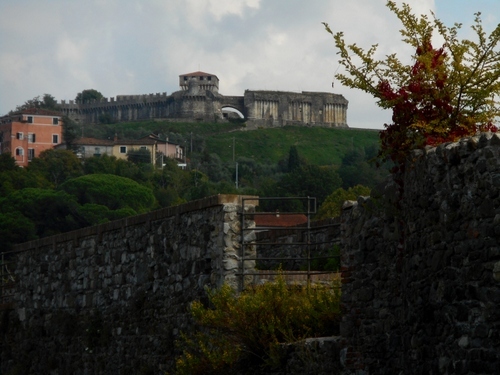 The castle of San Giorgio. 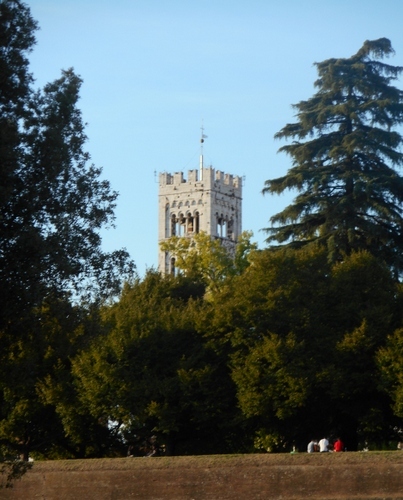 I still haven’t managed to see this castle, perched on top of the city, when it is open. It houses the Ubaldo Formentini Civic Museum. A must-do on my next visit. Actually, the nicest sights of La Spezia are to be had just walking around this largely late nineteenth century city. There are superb examples of art nouveau buildings, a lively market (on Fridays), an elegant seaside esplanade and much else to look at and enjoy. One of the places I liked most on our most recent to La Spezia was the not-even-mentioned Parish church of Our Lady of the Snows which is placed right in the centre of the city’s main shopping street, Via Garibaldi. I’d passed this zebra-striped church several times before but decided finally to have a look at its interior this time. I was quite overwhelmed by the church’s beauty. 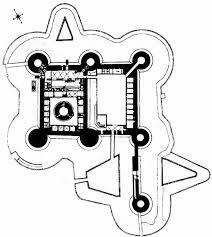 Its architect, Ferrari d’Orsara, drew his inspiration from local Romanesque, Ravennan byzantine (especially San Vitale) and the plan of Rome’s Santa Prassede. Built to house a miraculous image of the Madonna, the church has three aisles which are covered by neo-byzantine paintings and finished with Verona red marble giving the whole ambience a beautiful sunset-like tinge. The sanctuary is awesome and the dome’s mosaics are stupendous, transporting one back to Ravenna itself. Although not on the list of major tourist sights to a Spezia I would rate the church of Nostra Signora della Neve as one of the most unusual monuments of fin-de-siècle church architecture. 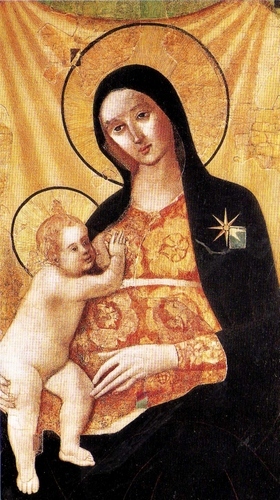 It’s a wonder – perhaps due to the miraculous image if the Madonna – that,whereas practically the whole of via Garibaldi was levelled by intensive bombing during World War II, the church remained undamaged. There may be some truth in divine intervention after all! The name itself evokes beauty – Portovenere, the port of Venus – and indeed it is a goddess-like place. Embracing an arm of the immense golf dei Poeti, the gulf of poets with views on one side towards the fantasiose rocky coastline of the Cinque Terre and on the other looking across to the highest of the Apuan Alps, Porto Venere is a place to return to again and again and never be disappointed. Porto Venere takes its name from an ancient temple dedicated to the Goddess Venus This temple has since been built over by the little church of Saint Peter which stands at the end of the promontory leading to the harbour as if to wish every departing sailor a safe journey and to welcome home all those who have risked the often perilous Tyrhennian sea. 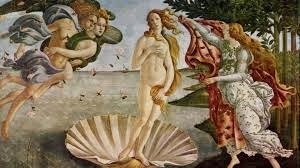 There is yet another connection with Venus in Botticelli’s exquisite picture of the goddess’s birth, now in Florence’s Uffizi gallery. At the right side of the painting you can see part of Porto Venere bay with the islands of Palmaria, Tina and Tinetta which form a little archipelago facing it. The lovely Venus is none other than Simonetta Vespucci, the girl who lived next door to Botticelli when he stayed there and with whom he fell inexorably in love. Considered the loveliest woman of the time, Simonetta tragically died of typhus in 1476 aged just 23. Botticelli immortalised Simonetta in one of the world’s most iconic and gorgeous paintings. while flowered maidens wait with cloaks unfurled. between her thighs the heart of all the world. as slender fingers cover perfect breasts. to arcane planet’s mantle-hidden fount. to squeeze sweet juice that always satiates. On this visit to Portovenere we climbed to the top of the Doria castle, surely one of the most formidable defences built by the Venetians. We had the place practically to ourselves, far from the increasing crowds of tourists visiting this heavenly part of the Italian coastline. The views were magnificent and the sea so blue! We visited the church of San Lorenzo, the patron saint of Portovenere and saw the miraculous log which was cast on the shore filled with sacred treasures and reliquaries. Byron was just one of the poets who fell in love with this area. One could add Shelley, Montale, D. H. Lawrence, George Sand, the painters J. M. W. Turner and Arnold Boklin, Baroness Orczy, she of the ‘Scarlet Pimpernel’, and Dante himself who describes the coastline in his Divine Comedy (Purgatorio Canto V)..
Our hungry stomachs beckoned us to a charming little osteria on one of the caruggi or narrow streets which characterise Porto Venere where we enjoyed an appropriately fish-based meal. It was, indeed fish Friday, my wife is born in the sign of Pisces and the waters around us are fishermen’s paradise. Another type of beauty beckoned us as we returned to our starting point – a rally of vintage cars ranging from Bugatti to Bentley to Bristol. 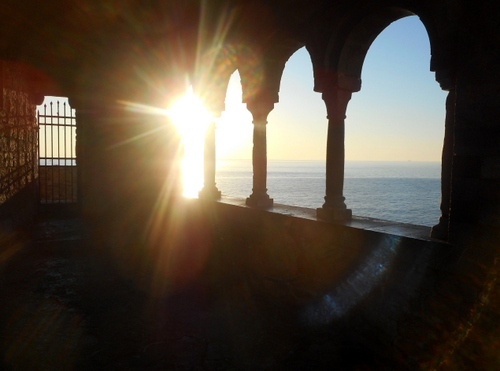 Their sinuous curves showed me the entrance towards yet another beautiful chamber in the paradise that is Portovenere. The ‘Cinque Terre’, that dramatic piece of Ligurian coastline which incorporates the little towns of Riomaggiore, Monterosso, Vernazza, Corniglia and Manarola, almost desperately clinging onto the rugged coastline to avoid being swallowed by the sea, are easily accessible from Bagni di Lucca and are rightly very popular (sometimes I think too popular) with walkers traversing the footpath connecting the five places. Porto Venere is actually a sixth town on the list, so the ‘Cinque Terre’ should more correctly be called the ‘Sei Terre’. However, since Porto Venere doesn’t have a railway station and is reachable by bus from La Spezia it’s often left out. This is a great pity for Porto Venere is one of the most beautiful places on earth and it was only this week that I first visited it after ten years of making Italy my principal residence. How strange! I then took the 11P bus to Porto Venere from Viale Garibaldi which is just ten minutes from the station. Parking must be a headache in Porto Venere and the road to it is twisty and often narrow. The greatest hazard, however, is not the road itself but what you can see from it: the views are so spectacular that you could be easily distracted and plunge to your doom over the often steep sides! The whole public transport journey from Bagni di Lucca to Porto Venere takes a little over two hours if you study your connections well. 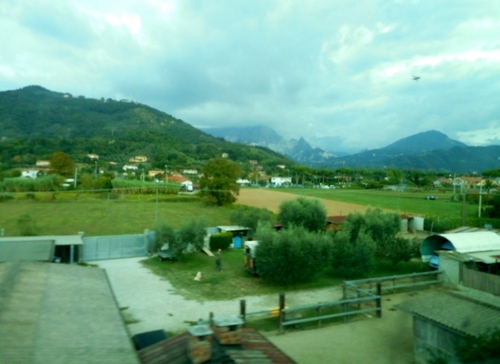 My return journey took me via Viareggio and Lucca involving a couple of changes but I was glad I didn’t use my own transport. There is something quite magical about visiting normally tourist-infested haunts in mid-winter when there only a few hardy souls about. There may not be many bars, restaurants and souvenir shops open but the freedom from crowds is surely something to be enjoyed. It’s great that we have these wonderful places, so different from our mountain haunts in their seascapes, at such a close distance from the Val di Lima. What other country, I wonder, has so much variety packed in so small area of territory? and for restaurants and bars one is spoilt for choice: it has truly a culinary prodigiousness..
Italy is famous for its historic cafes but one doesn’t have to go to Padua’s caffé Pedrocchi or Lucca’s Caffé Simo (one can’t enter that one, anyway as it’s been shamefully closed for several years now), Sarzana has one of its own and it’s placed on the corner of an almost fantailed shaped piazza which I would rate as one of the most charming I have come across in Italy. 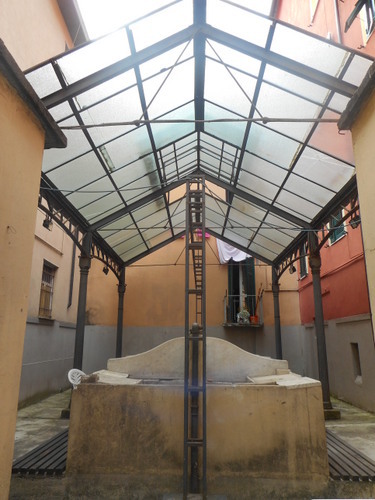 The Piazza Matteotti is especially important as it’s one of the very few documented places where Dante is known to have been during his exile and where he received a safe conduct from the Duke of Malaspina. As the inscription in the square states “Ombra di Dante non si cancella”. (One cannot cancel Dante’s shadow). The Caffé Costituzionale (like so many other historic cafes in Italy) was a centre of intellectual and political discussion and a hotbed of ideas leading towards the Italian Risorgimento. Founded in 1833 by Signor Manena it was the meeting place of patriots including Berghini who was a member of the Giovane Italia (young Italy) movement. It still preserves something of the atmosphere of those heady times. Certainly, political discussions were still going strong. Historic cafes are normally overpriced but this one certainly wasn’t’! Two euros provided me with a caffé macchiato and a brioche with crema pasticciera brought to my outside table for just two euros. I could have stayed more but now needed to be on my way to discover some of Sarzana’s churches. On the way I passed this nineteenth century former launderette. 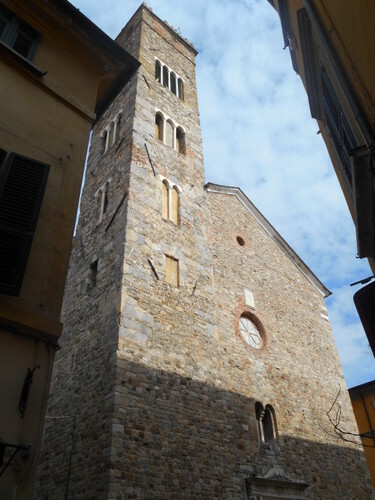 The Pieve di Sant’Andrea is Sarzana’s oldest church and dates back to the tenth century. 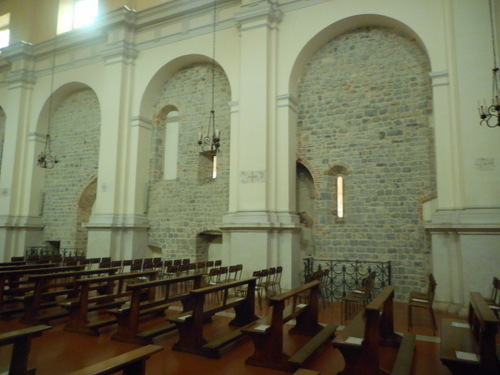 Like so many other churches in Italy, it had a baroque make-over but more recently the side walls have been laid bare to reveal a far more ancient Romanesque building. In the wall niches there are some very beautiful statues dating from this earlier period. Inside I was bowled over by the width of the gigantic spans separating the nave from the aisles. 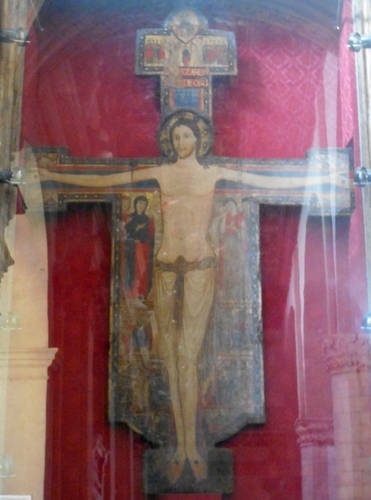 However, the greatest treasure of Sarzana cathedral and certainly one of Italy’s greatest artistic riches is the painted crucifix by Mastro Guglielmo which dates back to the eleventh century. It’s the oldest painted crucifix in Italy pre-dating those masterpieces by Berlinghieri and Cimabue by over a hundred years. Interestingly, Christ is shown triumphantly on the cross and not passively suffering as became the fashion later on (and remains to this day). The “ecclesia triumphans” had to be the motto at the end of the dark ages when power and glory battled against the sinister forces which destroyed Rome and almost demolished Western civilization. Returning to catch my train I passed some elegant art nouveau houses. 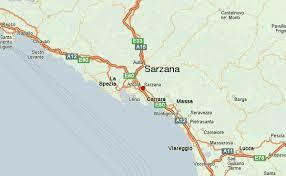 Here too, Sarzana showed itself as one of Italy’s most delightful towns. But perhaps I shouldn’t say this as one of the pleasures in perambulating its streets and alleys was to encounter a minimal number of tourists. It’s some jolt to be returning from the fifth driest country in the world, Jordan which is yearning for water, to an Italy which is literally being submerged by rain, rain and more rain. Yet little news of the present grievous state of this country appears to reach other European TV channels (or am I wrong?). ALL areas are now affected by the “maltempo” (bad weather). One of the worst affected parts is Chiavari next to Lavagna where I stayed while on a teacher exchange in 1995. But, to repeat, all areas of Italy are affected and I was concerned about further landslides on my road back to Longoio on Monday. 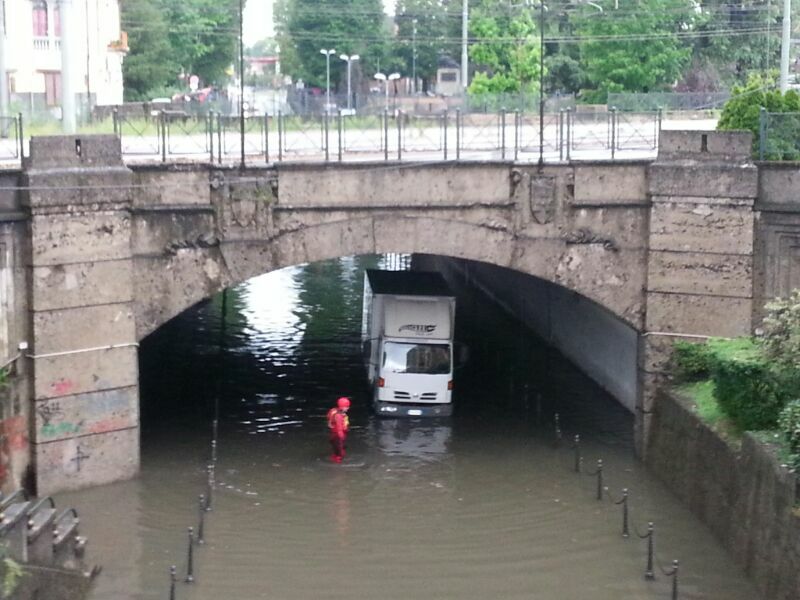 2014 has seen almost unrelenting rain throughout all parts of Italy throughout the year. The vendemmia has been a disaster, thousands of families have had to leave their homes, there have been a considerable number of deaths, and communications by road and rail have been severely affected. Where is that “beaker full of the warm South” so beloved of Keats, and the dream of so many visitors to and ex-pats of this beautiful country? There are, in my opinion, three reasons of this state of affairs in Italy. First, unquestionably, global warming. Temperatures here have been above average for most seasons and even now, well into November, autumn (or fall, if you like) colours are just peeping through and most trees still have their leaves on. I compared photographs taken of my area five years ago at this very time with those of today and the difference is very clear. Second, Italy is a geologically very young and fragile country with none of those ancient (and stable) rocks one gets in the UK. There are certainly no Cambrian strata here – most of the country is made up from the relatively recent folding mountains era and plains are largely alluvial and not eroded. The country is still very much on the move and to top it all, most of it (except Sardinia) is highly seismic. Third, and most immediately telling, is the lack of money with consequent lack of investment (especially in geologists) in providing for an adequate natural drainage system in Italy’s 80% hilly scenario. From a largely agricultural economy in the immediate post-war period to a largely industrial one by the eighties, with huge areas submerged under concrete, millions left the formerly beautifully manicured countryside which now, in vast tracts, is reverting to an almost primeval wilderness. Again, old photos of my area show terraced barley and wheat fields where today the voracious acacia tree is taking over everything which is not cultivated. What to do? No place is now safe to live in in Italy. In the last forty years alone over four thousand people have died in flash floods or “bombe d’acqua” (water bombs) as they are known here. More rain fell in Piacenza in two years yesterday than in the entire previous year turning whole streets into rivers of mud. Sondrio is virtually cut off by landslides, Milan’s traffic underpasses have been turned into canals, and the level of the Po, Italy’s longest river, is giving everyone sleepless nights. And when all this is added to this year’s previous disasters at Parma, Genoa, the Puglia, Sardinia (the list is seemingly endless) anyone who thinks that coming to live, whether permanently or semi-permanently, in Italy means a life of peace and stability needs radically to think again. Damage to our property? Keep fingers crossed. The only significant damage is seeping dampness into the walls which now require re-plastering, and moss on some of my library books which have had to be moved from their shelves. Our orto (allotment) this year has been a disaster, especially for tomatoes (as it has been for everyone else). This is a warning to outsiders: Italy is in a mess! We knew it has always been in a mess politically since it was unified in 1861. We know that has been in a mess economically since the crisis hit in 2008 (the economy is now classified not just as being “in recession” but being ”in stagnation”). 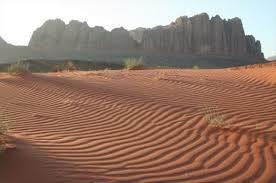 We know that, with a vengeance unheard of before, it is in a mess geologically and ecologically. What makes a true lover of Italy then? Not the connoisseur admiration of its inestimable number of world heritage sites (over half of the world’s such sites are here in Italy). Not the appreciation of its exquisite cuisine. Not the simpaticismo of its natives (although there is increasing evidence of their “nervosismo” (translated as “irritation and not “nervousness”)). What makes a true lover of Italy today is the ability to put up with the unceasing vacillations of the political weather, the desperate weather of its economic position but, most of all, the unpredictable and often frightening natural weather which has never hit us so hard as this year. I can only hope that this phenomenon is a passing phase, although, somehow, I doubt it. Storms are getting worst throughout the world, especially in the USA. I think that Italy will have to do a lot to re-adapt its life-style to what could well be an increasingly different and challenging climate pattern. When I’m no longer able to have my morning cappuccino and pezzo dolce in a piazza with some sunshine in it then I might begin to waver (but only slightly – I shall always be a lover of Italy). La Dolce Vita then? Not quite…La Dolce Vita Amara is more like it, perhaps.